Leicester City ensured they will be top of the Premier League at Christmas by beating Everton at Goodison Park. 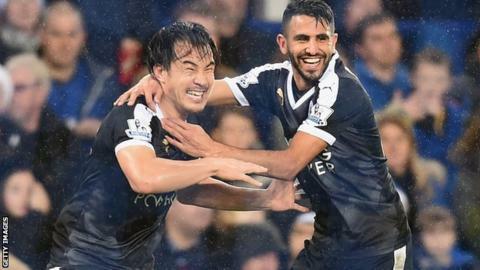 Riyad Mahrez scored the first of two penalties after Ramiro Funes Mori held back Shinji Okazaki. Romelu Lukaku levelled, but Everton goalkeeper Tim Howard tripped Jamie Vardy to allow Mahrez to again convert from the spot. Okazaki fired in a third for the Foxes, who held on despite Kevin Mirallas' late strike. Leicester, predicted to be relegation candidates by many commentators before the start of the season, are now the only team in Premier League history to be bottom on Christmas Day one year and top the following Christmas. Claudio Ranieri's side will go into their game at Liverpool on 26 December as leaders, regardless of the result of Monday's match between second-placed Arsenal and third-placed Manchester City. Discussion around Leicester's remarkable season has centred on how long they can continue to upset the odds and remain in the title picture. Once again they provided an energetic, controlled performance that will leave the doubters waiting at least one more week for any signs of a collapse. There was a worry for Leicester late on as Vardy clutched his hamstring while being replaced, and Ranieri will know that the fitness of his England striker is key to his side's burgeoning title hopes. Vardy, who has 15 league goals this season, has been a sensation, alongside team-mate Marhez, who took his tally to 13 with two well-taken penalties. The pair were involved in all the Leicester goals, Mahrez releasing Vardy to win the penalty for Leicester's second, and former Fleetwood forward Vardy providing the low cross which Okazaki shot left-footed into the bottom-left corner. Everton played their part in an entertaining, open game, but it was not enough to prevent extending their winless run in the league to four games, following three successive draws. There were notable groans and sounds of frustration around Goodison Park in the latter stages, which will make manager Roberto Martinez aware he is not matching the expectations of his club's supporters. Lukaku's continuation of his scoring run, which now stands at seven consecutive Premier League games, was made possible by of the industry of Ross Barkley, who had two efforts on goal before the ball fell to the Belgian to fire into the far corner from the edge of the six-yard box. And it was Barkley's creativity again that gave Everton late hope, as he slipped in Mirallas with a clever backheel flick for a sweetly hit 89th-minute strike past Kasper Schmeichel at the near post. But Barkley's performance was not enough to lift the 10th-placed Toffees out of their mid-table slumber. Everton boss Roberto Martinez: "Leicester will always make it a game that will suit them. That's real credit to them. "They are outstanding on the counter-attack and I thought we stopped that really well. "They tried to take as long as they can with every restart and it seems that frustrated our play a little bit. "We had a sense of control and that allowed Leicester to get goals from disappointing positions. We need to learn and get a lot better." Leicester City boss Claudio Ranieri: "I am satisfied because we were against a fantastic team. We worked so hard to concentrate during all the match. "It only gets harder when you are down the table. For our fans and everybody it is a dream. We have to concentrate now and clear our mind. "Our target is 40 points and I want to speak to my players. It is important to understand what they believe they can achieve and also I will say my ideas about them. "If some players relax they go out the team. That is my philosophy and they know that." Everton travel to Newcastle on 26 December, looking for a first league win in five games, while Leicester are at Liverpool, before hosting Manchester City in a top-of-the-table clash on 29 December. Match ends, Everton 2, Leicester City 3. Second Half ends, Everton 2, Leicester City 3. Nathan Dyer (Leicester City) wins a free kick in the attacking half. Attempt saved. Leonardo Ulloa (Leicester City) right footed shot from the centre of the box is saved in the bottom right corner. Attempt saved. Ross Barkley (Everton) left footed shot from outside the box is saved in the top centre of the goal. Attempt blocked. Gareth Barry (Everton) left footed shot from the centre of the box is blocked. Assisted by Leighton Baines. Foul by Nathan Dyer (Leicester City). Goal! Everton 2, Leicester City 3. Kevin Mirallas (Everton) right footed shot from the left side of the box to the bottom left corner. Assisted by Ross Barkley. Attempt blocked. Romelu Lukaku (Everton) left footed shot from the centre of the box is blocked. Assisted by Aaron Lennon. Corner, Everton. Conceded by Marcin Wasilewski. Offside, Leicester City. Shinji Okazaki tries a through ball, but Jamie Vardy is caught offside. Substitution, Leicester City. Ritchie de Laet replaces Riyad Mahrez. Attempt missed. Romelu Lukaku (Everton) left footed shot from outside the box is too high from a direct free kick. Corner, Everton. Conceded by Andy King. Tom Cleverley (Everton) wins a free kick in the attacking half. Attempt blocked. Ross Barkley (Everton) right footed shot from outside the box is blocked. Assisted by Kevin Mirallas. Substitution, Everton. Kevin Mirallas replaces Arouna Koné. Attempt missed. Romelu Lukaku (Everton) right footed shot from a difficult angle on the right is too high. Assisted by Seamus Coleman. Goal! Everton 1, Leicester City 3. Shinji Okazaki (Leicester City) left footed shot from the centre of the box to the bottom left corner. Assisted by Jamie Vardy. Goal! Everton 1, Leicester City 2. Riyad Mahrez (Leicester City) converts the penalty with a left footed shot to the bottom right corner. Tim Howard (Everton) is shown the yellow card for a bad foul. Penalty conceded by Tim Howard (Everton) after a foul in the penalty area.